Next month Fred Bueltmann (FB) and Kyle Bice (KB) will be taking to the Amtrak rails to discover beer in the ultimate coast-to- coast spring break. Bueltmann, who is the owner and VP at New Holland Brewing Company and Bice, a photographer and artist, will be chronicling their adventure through an immersion project that will be a close look to "understand and explain the cultural shift and craft renaissance our country has witnessed over the last thirty years." 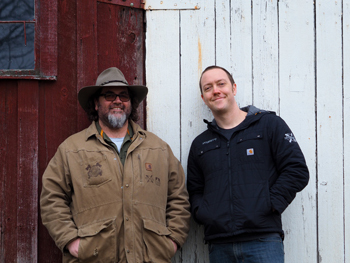 Throughout their 20 city tour, the pair will be visiting beer makers and sharing their experiences along the way. We sat down with the duo before they embark in early April to find out who they are and what they plan for their passion project, This Craft Nation. FB: As a music major/professional in the college years, I originally believed business to be the threat to creativity. Since my first beer job in 1991, I've fallen in love with the imagination, creativity and inspiration found in the people that make things to put out there in the world. I'm passionate about connecting people and celebrating the beauty of caring about what you buy and who you support. KB: I've been drawing almost as long as I can remember. I've always been interested in how things work, how things are designed and who is making all of the things around us. As a kid I built custom vehicles for my G.I. Joes. I drew pictures of cats, dogs, toys, and monsters and tried selling them to my neighbors. I read lots of comic books too, more than your average kid. When I went off to college I initially thought I would end up being a photographer. I didn't really know much about the art world outside of comic books but I moved to Chicago and quickly became enamored with the art history after many visits to The Art Institute. I fell deeply in love with oil painting, watercolor painting and portraiture. After college I bounced around in the illustration world and eventually found myself back painting for myself as well getting back behind the lens. All that combined with working in craft beer has made for an interesting past decade! What brought you into beer? FB: I was a homebrewer, trying to pay my way through music school, and got hired at a Chicago beer distributor. I homebrewed because I found it amazing that we could create something from nothing. At the distributor, I felt like I was a caretaker and matchmaker, defending our book of specialty beers and finding the right beers for the right customers. KB: My love of art and burlesque led me down the path of abandoning the everyday domestic beer which may sound a bit strange. Through a burlesque show my wife is in, I came across New Holland Brewing which then put me in front of a kindred soul, Fred Bueltmann. Fred then gave me a gentle shove into craft beer then later hired me to create label art for New Holland. Tell us more about how you met. FB: We met through Kyle's wife, Natanya - who I had met through mutual friends. We had hired her Burlesque Troupe, Belmont Burlesque Revue, and became friendly collaborators. Eventually, I saw a character sketch Kyle did in his mechanics shop while waiting for his car hit my social media feed. I reached out, and eventually hired him as a freelance illustrator for New Holland. KB: I believe it was during a Cub's home opener event that, at the time, seemed like complete chaos. Which, if anyone knows Wrigleyville in Chicago on the Home Opener, you'll understand that. What was the inspiration for the trip? FB: We had similar ideas, born from previous collaborations. We both wanted to dig into the power of story, share the passion of talented people and do so artistically and passionately. KB: My inspiration comes from a couple of different directions. The first being my love of Gonzo Journalism made famous by Hunter S. Thompson in Fear and Loathing in Las Vegas. It was huge influence on me growing up. The other bit of inspiration comes from my love of travel journals by famous artists and authors of yesteryear. I love seeing the inner workings of any adventure. Any cool places you will be hanging your hat? FB: All of them! We're particularly excited about hitting Louisville for Gonzofest and New Orleans, but really - each stop is exciting. It will be hard to have to move so quickly, after meeting so many cool people. What are you most excited about for the trip? Most worried about? FB: We're excited about immersing ourselves in story and embracing the unexpected. I'm worried about fatigue and the potential of missed connections to people based on tight timelines. KB: Learning is my number one priority and interest. I'm hoping to meet as many characters to draw, paint, photograph and learn from as I can. I'm mostly worried about the little things any traveler worries about, i.e. did I bring enough socks and underwear? What will the weather be like? Will I be too tired for certain days? Etc etc. Is there any one stop in particular you are looking forward to? FB: It's hard to pick one. I'm very curious about Sadowsky Guitars, as he has a really interesting take on scaling his business up, and I'm very curious to hear his take on things. I'm also looking forward to the stories and inspiration behind Third Man Records. Who are you leaving behind on this trip, and what do they say about the endeavor? FB: My wife Ulla is very supportive of the project, however the frequency and speed of travel is very contrary to her European/Danish instincts. She would love to see us stay longer at each stop. KB: Family, friends and cats. My family and friends are all excited for me. I suspect the cats are already mad. What's the end goal of the trip? FB: To share the progress and growth of the connected lifestyle and inspire more engagement in the future. We continue to have wonderful access to higher quality experiences, but they're sometimes hard to find or overlooked. I want to encourage the world to engage fully and enjoy making their lifestyle as colorful and gratifying as possible. KB: For me, the end goal is a combination of becoming a better listener, a better storyteller and to learn from the people we talk to as well as the experience ahead of us. Kyle, how do you use beer as paint? Is that literal? KB: Haha! I get this question pretty often and it's one that I love to demonstrate in person. Painting with beer is similar to painting with watercolor. It's trickier in a lot ways and very limiting. The beer dries much slower than normal paint and it has to be layered up to get varying degrees of darkness. It's also mostly water soluble before I seal it in to the paper so I have to be very careful to not get it wet unless I'm trying to erase an area. FB: We hope people enjoy following the trip, look forward to hearing from them along the way. We also look forward to sharing the stories and lessons over the next year. KB: Can't wait to get going. I want to face the fear of the unknown head on and learn about all of the interesting people in the makers movement around the country!